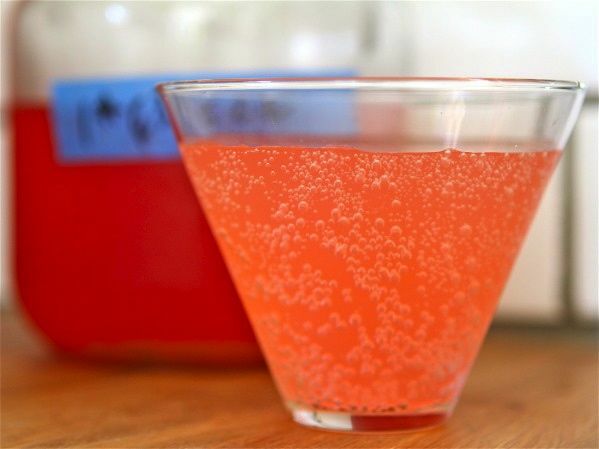 All a shrub syrup needs is equal parts (by weight) ripe fruit, sugar, and vinegar. It’s helpful to have a scale to determine that the ingredients are all the same weight. But because shrub-making isn’t an exact science and personal taste is the key to success, use these guidelines instead if you don’t own a scale. Combine the fruit and sugar in a wide-mouth glass jar. Use a muddler or wooden spoon to apply gentle yet firm pressure, enough to break up the fruit. Cover the jar with a lid or plastic wrap and let it sit in a cool, dark place for at least 5 or 6 hours, or up to 24 hours. After 24 hours, add the vinegar and aromatics, stir until the sugar has dissolved, and return, covered, to a cool, dark spot (or the refrigerator) for a week or slightly longer, until the flavor is fully realized. After a week, or when the flavor is to your liking, press and strain the contents of the jar through cheesecloth or a fine-mesh sieve, pressing lightly to release all of the liquid from the fruit. Store in a clean container in the refrigerator for another week, or until the flavor of the vinegar mellows and fades into the background. The shrub will keep in the refrigerator for up to 6 months. Serve it with sparkling or still water, over ice, or create your own cocktail by mixing the shrub with a spirit (gin, rum, or vodka), complementary liqueur, and bitters.